A rendering of the new renovations of Kresge College, approaching from the north bridge. The building the Owl’s Nest Cafe currently occupies will be torn down and replaced with study space. Photo courtesy of the Kresge Project Committee. Kresge College, shadowed by redwoods and most accessible by pedestrian bridge, is slated for renovation in fall of 2021. What many remember as an isolated hillside town will adapt to a bustling pedestrian highway once the project is finished. The Kresge Renovation Project released its environmental impact report (EIR) for public comment on Nov. 20. An EIR is an array of impacts a construction project may have on its designated site, an assessment of their severity and the possible ways to avoid them. Reports like these are required by the state of California before construction. The project planners hosted an open meeting on Nov. 27 at the Louden Nelson Community Center and at the Town Hall in Kresge College on Nov. 28 to walk attendees through the EIR and the design, and receive comments from the public. Eleven people attended the meeting downtown, and 15 came to the Town Hall. Three current Kresge students were present at the Town Hall and none at Louden Nelson. In the case of the Kresge EIR, there were eight significant level impacts. They spanned several categories, and community members brought the most attention to impacts on water supply, building on sensitive amphibian habitat and effects on the college’s unique culture. All of the impacts listed were mitigated by solutions that would not affect the design plans. 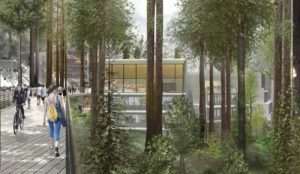 Senior project manager Jolie Kerns and UC Santa Cruz senior environmental planner Alisa Klaus said the idea is if a problem arose, the EIR could accommodate it, but if it proves too difficult to work around, the decision to move on to an alternative idea falls to the regents. The regents’ role in the process is primarily to approve the project and allocate funding for it. Because of state budget cuts, the regents’ policy toward campus infrastructure is finding an equilibrium between the needs met by the project and the lowest price available. “This doesn’t equate to doing the lowest upfront cost as much as the best long-term value to ensure buildings meet the needs of our students while also providing quality that will last throughout the building life cycle,” said Sarah Latham, Kresge Committee member and vice chancellor of business and administrative services in an email. One impact not explicitly detailed in the report, but voiced by students and community members, is the concern the Kresge personality as it stands would not survive the renovation. But to Ben Carson, Kresge College provost and member of the Kresge Planning Committee, expansion is inevitable. Developments to the north include a new 600-seat lecture hall, the largest on campus. Both bridges will be widened and the college will be made compliant with the American Disabilities Act. The existing Town Hall will be relocated to the southern entrance of the college and expanded to seat 275 people. Three new, large residence halls will be constructed for first-year students, which will produce a net increase of about 200 new beds. Students shared their own concerns throughout the design process, voicing them through significant pushback at Town Hall meetings and surveys. “The rebuilding of the college is scary for our community. Students feel there has been little student representation on the planning committee,” according to the minutes report of a Kresge Parliament meeting in March of 2017. These concerns are aggravated by the overlap of the EIR comment period with finals week and winter break, when most students will be either preoccupied or away from campus. Student input on the project is essential so far in carrying forward the pillars of community that make Kresge the college it is, said project manager Jolie Kerns. She expressed while the format of the college will be altered, she hopes the philosophy of Kresge will do more than survive.